This isn’t about politics. Writing about that gives me a headache. This came to me in the grocery store as I was trying to figure out how many groceries I could buy with the $100 bill in my pocketbook. What is it with American food companies? 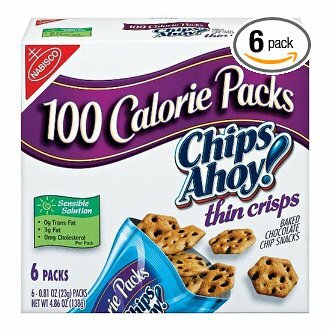 Do you really believe that they are doing us a favor by selling the 100 calorie mini bags of snacks. I don’t think so. What I believe is ..the companies figured out that they could make a HUGE amount of money by promoting the eat less calories concept… Jump on the bandwagon while Americans are having it shoved down their throats that they are much too fat! There is one problem with all this. Americans are stretching their dollars like it’s the Great Depression and these little bags of goodies cost as much, if not more, than one bulk bag. Which makes me wonder just how dumb these companies assume Americans are. Is it too difficult to take two cookies (the serving portion) out of a bag and close the bag? I brown bagged lunches for 4 kids for many years and never had a problem taking snacks out of a bulk bag and putting a portion in my children’s lunch boxes. Took a big 30 seconds out of my busy day. Is our laziness making corporate America wealthy?